There are numerous benefits established by identifying which students are siblings within a school or district. Going beyond the practical, real-life benefits of this knowledge, there are the benefits provided by having this clearly identified within a Student Information System. This is immediately apparent when enrolling a new student into the SIS, as users are invited to lookup if a student has a sibling existing in the database through probable common datapoints like last name, phone number, parent name(s), address, and email address. If a sibling is identified, these commonly shared data fields are automatically populated, including address, Parent/Guardian information, and emergency contacts. 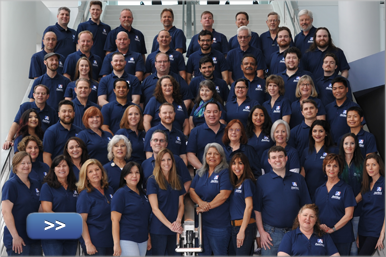 Aeries links multiple students together by a numeric field called Family Key. On the other hand, when this link between siblings through a Family Key does not occur during their enrollment for one reason or another, it can be difficult to accomplish down the line, especially at districts with thousands of students to consider. In the past, the narrative surrounding linking common data between siblings went something like this: manual linking of siblings is too tedious, but automatic matching is prone to errors. With a balance between automation and user-controlled options, Aeries has a solution for you! First of all, a new Sibling Lookup form has been added to Aeries on the Student Demographics, Siblings, and Contacts pages. Each potential match will show relevant fields from the other student's record. Fields that match will be highlighted. Each row also includes a Match counter, which is a number between 0 and 100 that indicates how strong the match is based on the number of fields in common. The best match will appear on top, and so on. While the Sibling Lookup form can help with the process of identifying siblings manually , we have a new Mass Assign Family Keys page to intelligently match students based on the criteria the user sets. You can define which contact records should be analyzed when processing siblings and then mass assign only those with the highest matched criteria. The same page can then be used to manually assess the remaining students, including the ability to create new family keys for a student who is an only-child or for siblings who do not yet have a family key defined. The Contact Processing Options will help tailor the Sibling Lookup to meet needs specific to your district by limiting with Contact records are analyzed when matching siblings. Enter a comma-separated list of code values for contacts to include: e.g. “P, G” where “P” is defined as Parent in the COD table and “G” for Guardian, and so forth. Enter a comma-separated list of code values for contacts to include: e.g. “M, F, G” where “M” is defined as Mother, “F” for Father, and “G” for Grandparent, and so forth. 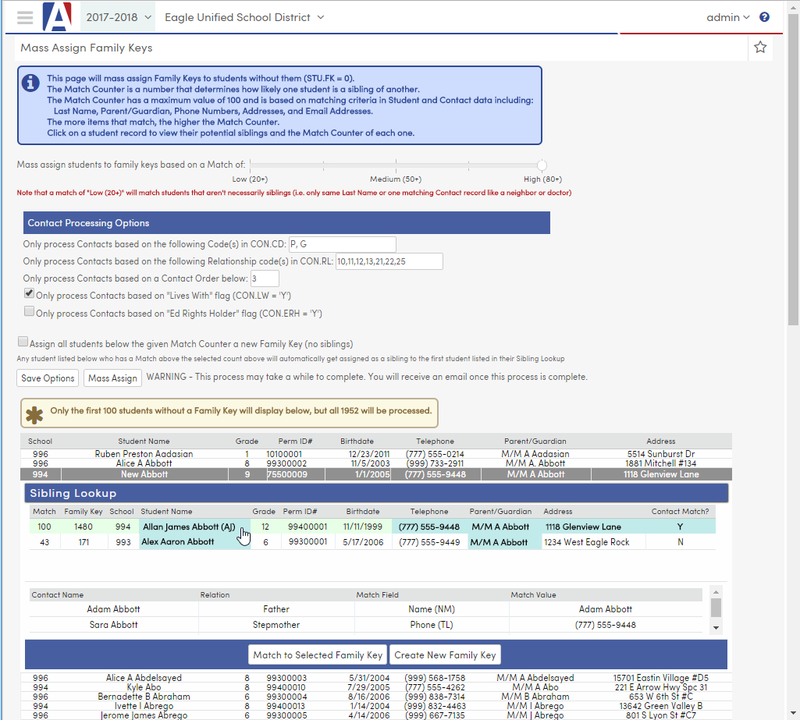 The options defined in the new Mass Assign Family Keys page are also utilized when adding a new student, allowing you to view the potential siblings and selecting either to match or to create a new family key. With these new tools, it doesn’t matter whether your district has proper Family Keys clearly defined for all but a handful of students or has a majority of siblings not linked together. 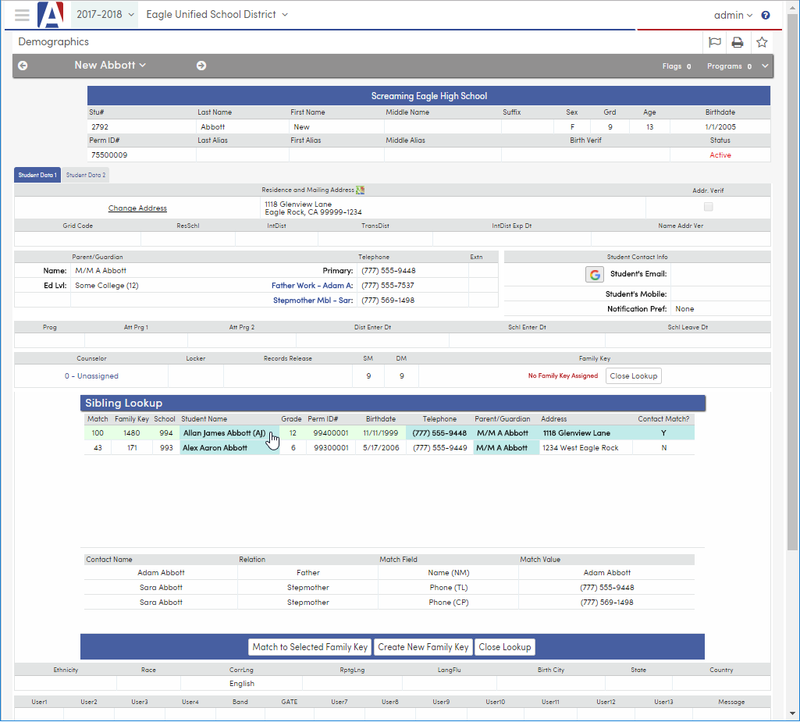 The Mass Assign Family Keys process will help to get caught up on those missing links in a quick and efficient way, and the new Sibling Lookup form will help to keep things on track and accurate moving forward.